From the Editor: Mark Riccobono serves as executive director of the NFB Jernigan Institute. On Saturday, July 6, 2013, he moderated a panel on one of the Federation's most exciting new programs, Braille Enrichment for Literacy and Learning, or BELL. Mark Riccobono: "It's the possibility of having a dream come true that makes life interesting." This quote is taken from author Paulo Coelho's book, The Alchemist, a novel that is now described as an eternal testament to the transformative power of our dreams and the importance of listening to our hearts. The Alchemist was first released when I was a rising senior in high school. At that time my vision was not much better than it is today--20/1000 on a good day in one eye--but I did not think of myself as a blind person. I did not read The Alchemist when it first came out because reading was a painful strain for me. I did not know what my dreams were because in my heart I did not believe that I had the ability to pursue them. I did not accept the opportunity to learn Braille because I did not have any idea why I would want to learn it. That year was the first time a teacher ever raised the idea of Braille with me. The expectation was not that I would learn Braille, but simply that they could teach me Braille if I wanted to learn it. Why would I want to? What would I gain? How would it help me pursue my dreams? No one presented answers to these mysterious questions. I was left with a riddle that had no obvious answer. Three years later I found the National Federation of the Blind. Instantly I had a circle of blind friends who took the time to teach me that I had something to offer, that I could pursue my own dreams, and that there were many great reasons to want to learn Braille. In The Alchemist Coelho writes, "When we love, we always strive to become better than we are. When we strive to become better than we are, everything around us becomes better too." This sentiment articulates my experience with the love and faith I found in members of the Federation and their expectations for me as a blind person. One of the many gifts I will always treasure from this organization is that my blind friends took the time to teach me why I would want to learn Braille and then to teach me how to read and write the code itself. Since learning Braille more than fifteen years ago, I have joined my blind brothers and sisters in seeking innovative ways to change the expectations related to Braille instruction for children and adults. In the journey presented in The Alchemist, we find that, "When you want something, all the universe conspires in helping you to achieve it." This is true of our movement as well--maybe the way to state it is, "When you dream of something, all the Federation conspires in helping you to achieve it." Members of our Maryland affiliate were tired of blind children being refused Braille instruction, and they had a dream of raising the expectations for these youth. In fact, it was Jackie Anderson, this year's NFB Distinguished Educator of Blind Children, and another blind mom who feared the low expectations the school system would have for their children and dreamed of building a better model for Braille literacy through the Federation. 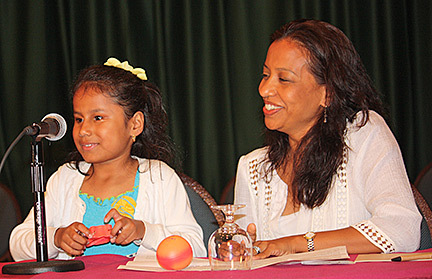 In the summer of 2008 the first Braille Enrichment for Literacy and Learning (BELL) program was held in Maryland. It was immediately clear that this program had the potential to change expectations for the education of blind children around the country. BELL is a two-week summer program to provide young blind and low-vision children with fun, intensive Braille instruction in an environment of high expectations and positive attitudes, with role models from the National Federation of the Blind. In The Alchemist we are offered the observation that "everything that happens once can never happen again. But everything that happens twice will surely happen a third time." After witnessing the impact of the first BELL Program, we brought the model into the Jernigan Institute, added some new components, hired some quality Braille instructors, and piloted our approach in Maryland and Georgia during the summer of 2009. Two affiliates were still not enough. Today we find rising expectations around Braille with the NFB BELL Program being offered this summer in almost 40 percent of our affiliates, but we will not have realized the transformative nature of our dreams until the bell rings for Braille literacy throughout every affiliate in our Federation. This morning we offer you different perspectives on the BELL Program to demonstrate why we all should be proud of our accomplishments and committed to the progress yet to be made. Our first presenter represents the long-time committed members of the Federation who understand the importance of Braille and who want to change the expectations. For even the most committed, the notion of undertaking the BELL Program may feel daunting. Here to share her experience, to invite you to raise your own expectations for what we can do together, and to confront your fears about leading the way with the NFB BELL Program is the president of the National Association to Promote the Use of Braille and the lead coordinator for the NFB of Virginia BELL Programs, Sandy Halverson. Sandy Halverson: I'm going to tell you how I went from skeptic (which I'm usually not) to sold on BELL, which I totally am now--how blind kids benefit, and why your state should find ways to join our National Federation of the Blind BELL ringers. The NFB of Virginia first began to consider conducting a BELL Program near the end of 2009. After a conference call to discuss some of our concerns with the Jernigan Institute education team, we decided that we simply couldn't afford to participate. I was thinking we were done with all that BELL business, when our president, Fred Schroeder, said, "Sandra ..."--I knew what was coming because he never calls me Sandra!--"I want a BELL Program in 2010, and I want you to coordinate it." So I said, "All right," but I was sure he was crazy, and I was certain it would not work. Throughout the BELL volunteer coordinator training weekend at our National Center, we talked about funding--we will never raise that much. We talked about recruiting five or six students from ages four to eleven for two weeks--we will never find them! We talked about the supplies, food, and volunteers that would be needed--not happening! However, since problem-solving is one of my strengths, and because I like the challenge of a project with lots of detail, I ditched my negative thinking and decided to act positively. After all, if I could come up with the hardcopy Braille system we have used since 1980 for tracking Washington Seminar appointments and reporting data collection, surely I could whip this BELL project into shape. So what does the coordinator do? Identify members in your affiliate, including your parents of blind children division--people who are passionate about blind kids; like fundraising; enjoy being out in the community; and have good Braille, travel, and organizational skills. Someone in that group is likely to be a member of a church that has school and playground facilities that meet our needs. Lots of churches do not charge for their use--though, like the NFB, they appreciate donations. Our members who manage vending locations will often contribute water, snacks, lunch, or whatever else they can; ask them. Become very familiar with the BELL curriculum. You won't be teaching all the classes, but the reading, writing, blindness skills, cooking, and craft projects will determine the supplies, transportation, and volunteers you need. Our funding comes from local Kiwanis and Lions Clubs, our local chapters, the board of the Virginia Department for the Blind and Vision Impaired, and one school district--a first-time occurrence for us. This year, for the first time, a mayor's commission on the disabled has said that they will cover the participation cost of two children in one of our programs this summer, a contact made by our scholarship winner, Tasha Hubbard. I certainly had never thought of that committee, but will from now on. The coordinator recruits a teacher of blind students and helps find parents. Before you decide you don't know any teachers of blind students or parents with blind children, our national office maintains databases of Braille Pals families, Braille Readers Are Leaders contest participants, free white cane recipients, Future Reflections readers, and those who receive American Action Fund Free Braille Books. Your library for the blind and state rehabilitation agency will often mail to families in targeted zip codes, but you get only the names of those who choose to register or contact you directly. Our Jernigan Institute staff will also help with information about teachers of blind students. Our first Virginia BELL Program did happen in 2010, and Virginia has been ringing bells throughout the state ever since. Jackie Otwell, whom many of you know, was a godsend to Mike Fish and me that year. Mike was a new teacher of blind students, and I was a first-time coordinator. Jackie Anderson, Casey Robertson, and Sheena Manuel are honorary Virginians and phenomenal teachers who are passionate about their work, believe in our positive philosophy of blindness, and love working with blind children. So what did we do in our first program? None of our students had been to a library containing a large collection of children's Braille books, so we decided to go to the Martin Luther King Library in DC. Our six kids, ranging in age from four to eleven, and lots of volunteers, one per child, used our canes to walk the two blocks to the bus stop. We boarded a bus, got off at a Metro station, had lunch at McDonald's (where our bill was so high I had to run my debit card twice), and rode the Metro. Our students used canes for the first time on escalators and walked several blocks, only to learn that we were in the wrong place. I think the adults had more trouble with the ninety-plus temperature and equally high humidity than the kids did. Retracing our steps and walking even farther was not a good option. I started handing out money like a drug dealer, organized our crowd in cabs, and off to the library we went. The kids had a great time and were absolutely worn out by the time their parents took them home at the end of the day. Our youngest student, Hannah, said, "I went on a bus, the Metro, and a cab. I want to ride in an airplane." I told her she'd have to talk with her mom about that. One of our kids ate kosher meals and snacks. Her parents packed her lunch items separately so that she'd have to put her sandwich together like everyone else. Kosher ingredients were used in our cooking projects as well. We went to a museum, a farmers' market, a local chocolate shop, and a boat ride to learn about Eastern Shore of Virginia water life. The field trips were not organized by the sighted for us; we did that ourselves. We didn't drive the bus or other transportation, but we talked about how, as blind people, we could get the information we needed. We talked about how we would transact our business with the drugstore proprietor; McDonald's; and Wal-Mart, where we bought ingredients for our closing ceremony ice cream social, using Braille cards indicating each student's purchase. We're teaching blind kids how to have fun and build self-confidence in their home and school lives. One of our kids was spotted in the grocery store with his mother, using the cane he had resisted at the beginning of our program. So what's in it for the kids? Carmen and Jada, two of our NFB of Virginia participants, are here attending their first national convention. They do not attend the same school and never met until last year at BELL. Now they talk to each other every day, probably more often than their parents know. They will be participating in our 2013 Virginia Beach BELL Program. Recruiting is part of everything we do. Each of us was recruited by someone to become a part of this organization. I was pleased to recruit Diane McGeorge after our first year of BELL, and I have gone on to talk with folks from Idaho, Illinois, Missouri, and California. I cannot commend our Jernigan Institute staff enough for their commitment to this program--the curriculum and the resources are always available to us. Coordinating a successful program takes time--talking with parents on multiple occasions until their child has been registered, recruiting volunteers, finding the location, reviewing IEPs and consent forms, resolving food and transportation concerns, and all the other stuff. A good coordinator delegates and follows up, confirming that all tasks have been completed. You get those guidelines from the curriculum, too. Thank you, Dr. Maurer, for your support of and commitment to this program to bring our message of hope to the next generation of young blind children. Thank you, Fred, for causing me to do something I didn't think would work. Thank you, John, for not complaining when I have one more call to return, when more BELL supplies are on our front porch, and when you'll have to bring home dinner again. This is why we do what we do, and may there be more of us next year singing "Ring My Bell!" Thank you. Mark Riccobono: Our BELL Programs create opportunities to engage with outstanding Braille instructors who had not known the Federation previously. They provide a means for us to train future teachers whose broader impact on the educational system will be the change we want to see. Our next presenter is one of those future teachers who will bring the spirit and high expectations of the NFB BELL Program to her work in the field. A blind woman who herself has had to overcome not receiving early Braille instruction in the educational system, and whose mentoring and passion for Braille now help fuel our NFB of Texas BELL Program, here is Kayleigh Joiner. Kayleigh Joiner: Like many other students in this country, I wasn't taught Braille because of my limited amount of residual vision. My TVI deemed me a visual learner, which made me feel like a broken sighted student. Secretly I began teaching myself Braille, through distance education courses from the Hadley School for the Blind, when I was thirteen years old. My TVI chastised me for teaching myself Braille. After a five-year battle with the school district, I finally received Braille instruction my senior year of high school. During this battle I realized that I wanted to become a TVI so that I could make sure no other blind students would have to go through the struggles I did. I know firsthand the challenges that come with visual learning for blind students. In the beginning of fourth grade my mom began to doubt whether large print would be effective for me. She saw me struggle to keep up with my sighted peers. When she approached the school district about these issues, she was blamed because she wanted me to do the same amount of work as my sighted peers. The school district wanted to exempt me from standardized testing and reduce my amount of work as a solution. They never considered Braille as an option or an equalizer. My mother was told, "You don't want her to look different," (as if having my face an inch from the book didn't make me look different already). In junior high and high school it would take me anywhere from four to six hours to complete my homework every day. The IEP team wanted to blame the time spent on the fact that I was taking several AP classes, instead of placing the blame where it belonged: on the choice of reading medium. This is why I am so passionate about the BELL Program. I want to help reverse the Braille literacy crisis by teaching Braille and other blindness skills to all students, including those with residual vision. I want to ensure that our future generation of blind students is literate. I want my students to believe in themselves. 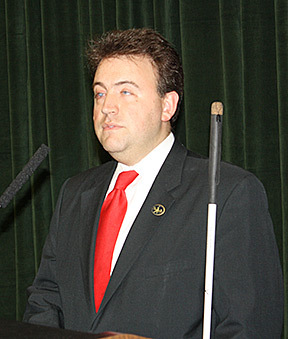 I want to lead by example to show that blind people can be independent, productive members of society. Even today blind students are being told that Braille is hard to learn. However, through activities such as Braille Twister, drawing pictures with the Perkins Brailler, and beach-ball Braille, the students in the BELL Program realize that Braille is fun and not hard to learn. Some students may be told that Braille is slow; however, in the BELL Program students hear competent blind adults reading Braille and realize that Braille is anything but slow. Through the Captain Whozit skit the students learn that the long white cane is a symbol of independence. They also learn about the positive and negative ways that blind people can be portrayed in books and other media. It is our goal for the students to leave the program with improved skills and a brighter outlook on their future. I first got involved with the BELL Program in 2010 and 2011 when I shadowed Emily Gibbs, our lead teacher of blind students. In 2012 Richie Flores gave me the opportunity to teach at our three BELL Programs in Texas. During that summer, not only was I teaching blind students Braille, but I was also learning how to be a better teacher. This program has reinforced my belief that even students with additional disabilities can benefit from learning the alternative skills of blindness. One student that I had last summer didn't believe that he could successfully pour water wearing sleepshades, due to his cerebral palsy. Because of my belief in him and his abilities, he was able to accomplish the task with great pride. Another student who was cutting up fruit for a fruit kebab didn't think that blind people could be chefs. This student didn't consider that cutting up fruit was something that a chef would do. I was proud to help broaden her mind about the jobs that blind people have. This summer I had the opportunity to teach nonvisual skills in our two BELL Programs in Texas. During the beginning of the week I noticed that one student was showing some resistance when it came to wearing sleepshades. He was on the verge of tears. I explained to him that wearing sleepshades helps develop our other senses. Lo and behold, by the end of the week during our sound scavenger hunt this student kept his sleepshades down, and his confidence in using his cane grew. It brings me such joy to see the growth in the students from the beginning to the end of the program. Some students are using their canes more than before, while others have gone from knowing no Braille letters to learning the first five. One aspect of the BELL Program that distinguishes it from other programs is that blind adults are teaching and modeling the skills of blindness for the students. This program is different from other day programs for blind children because the staff has high expectations for the students and encourages them to be independent. The BELL Program is a great opportunity for those who want to pursue a degree in education. It allows future teachers to gain experience in working with young children, implementing classroom management techniques, and planning curriculum. Working in the BELL Program is one of the highlights of my summer. By providing these students with a foundation in Braille, we are helping to ensure that they have a bright future, full of limitless possibilities. These students are the future of our organization, and I am proud to do my part in giving them the skills they will need to succeed and live an independent life. Mark Riccobono: My wife Melissa became president of our Maryland affiliate shortly after the first BELL Program, and Braille enrichment has been a significant part of our summer ever since. We did not know that two years later we would find an even deeper reason to build the dream of the NFB BELL Program. Our first daughter, Oriana, was born in May 2010. When the doctor first mentioned to me that her eyes did not respond as they expected, I immediately remembered the pain of my own struggle for literacy. The difference this time was that I already knew why Braille was important to learn and that the NFB BELL Program had raised the expectations for early Braille instruction. Our daughter is now three, and we are beginning to teach her the code. Next summer we expect her to be ringing the bell in our Baltimore BELL Program. Before I introduce our last speaker and our reason for building this movement, let me take a moment to thank my brothers and sisters in the Federation for giving me literacy. On behalf of my family I want to publicly thank Jackie Anderson, Sharon Maneki, and the other members of our Maryland affiliate who have made it possible for our daughter to ring the BELL someday--you have helped ensure that my daughter has greater opportunities than I had. That is why Melissa and I will not stop until all blind children have the same opportunity. Now for our star BELL ringer. She is a rising second grader at Springdale Park Elementary School in Atlanta, Georgia, who knows that Braille is knowledge and knowledge is power. Here to tell us about what the NFB BELL Program means to her is Raveena Alli. Raveena Alli: Good morning, my Federation family. Hope everyone is doing well and had a wonderful week so far. I know I did. Why did the boy bring a ladder to school? He wanted to go to high school. Why was 6 afraid of 7? Because 7 8 9. Today I am here to talk to you about the BELL Program. As you heard, BELL stands for Braille Enrichment for Literacy and Learning. Say it very slowly. The BELL Program teaches and supports Braille literacy among blind children like me. I attended my first BELL Program two years ago when I was four, and it was so much fun. The two-week summer program introduced me to that super heavy piece of machinery called a Braillewriter. The Braillewriter is now and will always be one of my very best friends because it has taught me how to write Braille. I also played with muffin tins and balls to help me learn the Braille cell. That was really cool. It took a little while for me to learn my alphabet, but now I have moved on to contracted Braille, and I can even make birthday cards and holiday cards with my Braillewriter. I really enjoyed the BELL Program because, in addition to learning Braille, we did arts and crafts and a Braille dance that I would really like to show you, but I might fall off the stage, and we wouldn't want that! I also enjoyed chatting, as you can see, and meeting new friends, and we talked a lot at lunchtime, and we went on field trips like to the Children's Museum. Besides learning to read and write Braille, the teacher and volunteers taught us about confidence and making sure we use our canes at all times to get around. They said we have to be independent, independent, Independent! At camp we also did a lot of role plays, teaching others to be polite and courteous. For example, letting people at the grocery store know that it is okay to talk directly to me. They don't have to talk through my mom to ask about me or my cane. I can politely answer and speak up for myself. We also did role plays to teach a sighted person to ask if help is needed and not just grab my arm; that's not really cool! I might need to take their arm, not the other way around. Mark Riccobono: There you have the journey of the NFB BELL Program. You do not have to be an alchemist to turn dreams into reality. You need the love, faith, imagination, and commitment that we find in this convention hall—the dynamic combination of elements that comes together to make up the National Federation of the Blind. Let the word go out from this day forward that we will not stop until the bell rings for literacy, freedom, and higher expectations for the blind in every community in our nation. Let's go for Braille!